Thank you to the students from the Miller School who added a handrail to this bridge on the trail segment alongside 5th Street (behind the Waffle House and Taco Bell) and moved a bit of trail away from the eroding banks of Moore's Creek. We appreciate their efforts! Today's rain didn't discourage the the monthly work party from digging post holes and installing a pair of barricades across a segment of the access roadway that runs between 5th Street and Jordan Park, where we're trying to encourage users to stay on the trail. As tempting as the roadway might look, it cuts across some private property and is meant solely for official access to the sewer right-of-way. This segment has been the focus of a couple recent work parties, so the official trail is in good shape and easy to follow. There - as along the entire trail - we need to be respectful of the generous landowners who have granted access to the RT by keeping to the official trail route. The Piedmont Environmental Council has released For the Love of the Land: 100 Conservation Stories from Across Virginia, and the Rivanna Trail is one of the stories described in the book. 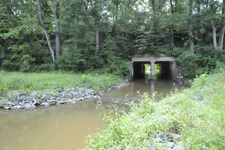 RTF's collaboration with the City of Charlottesville to protect the trail and develop the new Meadow Creek Valley Park (where the RTF is about to begin construction of a new bridge) are highlighted. Click the link above to explore an on-line version of the book; on the interactive map, you'll find the Rivanna Trail as story number 58. 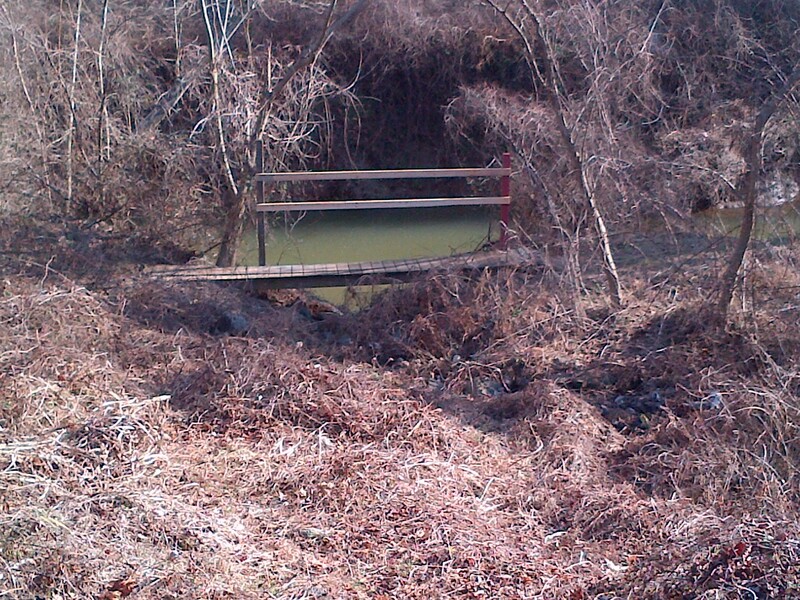 The Quarry Park bridge has been replaced. There's a little landscaping to do yet, but trail users can now safely cross Moore's Creek from Quarry Park and then hike on the Rivanna Trail either upstream toward Jordan Park or downstream toward the Woolen Mills. Volunteers and the City of Charlottesville, thank you! Hikers and cyclists, enjoy! Rock hop between Stribling and Sunset Ext'd reconstructed. "Fun" is the best word to describe watching nine enthusiastic Phi Gamma Deltas attack the challenge of rebuilding our rock hop in Moore's Creek today. 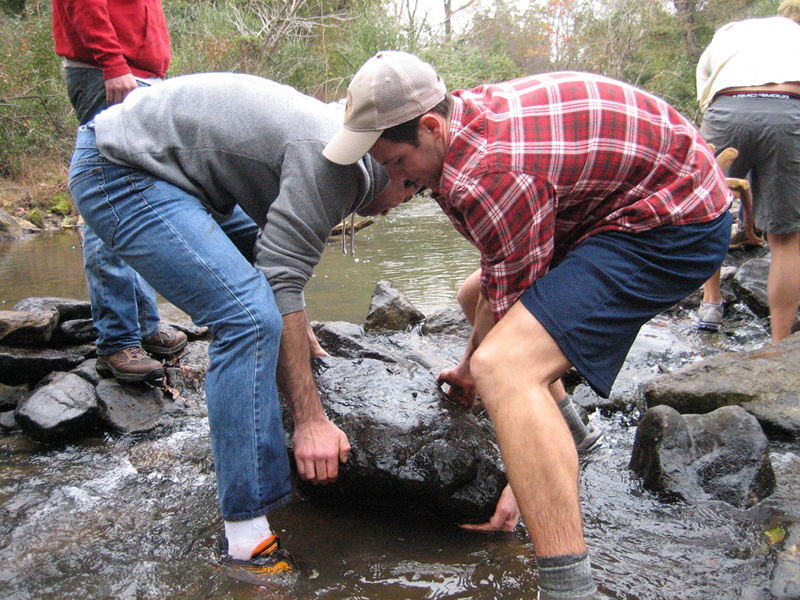 Having communicated well with us before they came, they knew exactly what they were facing: frigid creek water up to their knees, an end goal without a prescribed execution plan, and dozens of large rocks to move. The men assessed the situation, made a plan, began implementation, and inspired each other with cooperation, competition, cajoling, puns, quotations from literature and movies, and a little splashing. During construction they were visited by four dogs, four runners, an extended family with two little stick-yielding boys ["When we grow up, can we play in the cold stream, too? "], and three men on mountain bikes. The Rivanna Trail is a well-used treasure, the RTF could not keep it open without the help of volunteers, and everyone appreciates the work of these young men from UVa. Look for our new trailhead on Avon Street. 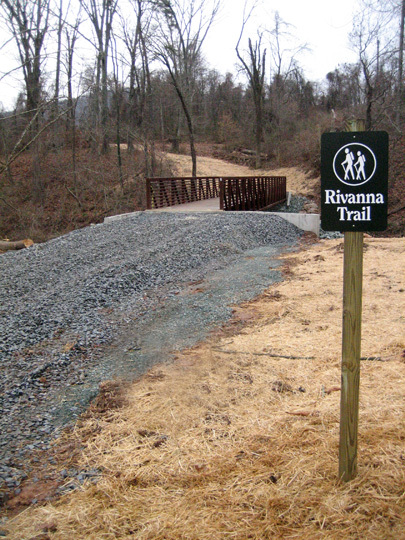 From Jordan Park, follow the Rivanna Trail DOWNstream, go UNDER the Avon Street bridge, and follow the new side-cut (benched) trail up to street level. If you want to continue on the trail toward Quarry Park, turn left at the street and walk south along Avon Street, cross the bridge, and turn left into the pine trees to pick up the rustic trail again. 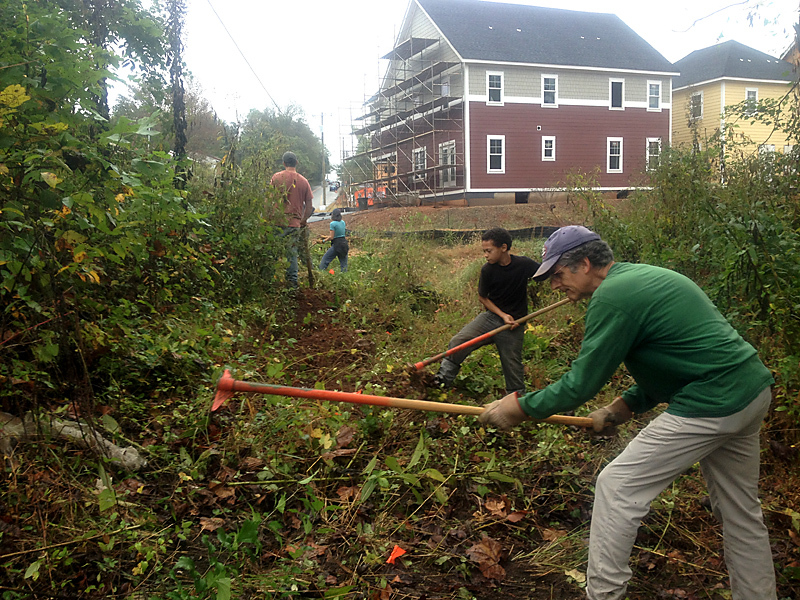 Have a look at today's terrific volunteers who ignored the drizzle and cut in this new trail. Thank you, young workers and adult mentors. It was a great day on the trail. We love our volunteers and supporters ! Sept. 14th 2nd Sat. Work Party Report - On a beautiful morning for trail work, and being outside generally, the Rivanna Trails Foundation was honored to have more than 30 volunteers dedicate their morning (and some early afternoon) to improving trail conditions. Our primary effort was going to be between the RTF shed (on Morton Drive) and Brandywine Rd, but with so many volunteers, we actually had a group working between Barracks and Leonard Sandridge as well. Many thanks to David Stackhouse of the Charlottesville Area Mountain Bike Club (CAMBC) for leading this group in trimming back the summer growth and improving some of the rocky sections. The group that worked closer to the shed was focused on digging trenches to encourage better drainage and less mud, and trail users will see evidence of this in numerous spots along the trail. The RTF would like to thank all the volunteers for coming out this morning, including the University of Virginia's Phi Sigma Pi, Mens and Womens club cross country teams, and Project Serve. In addition to the above fantastic turnout of volunteers, Kristen Rabourdin of Whole Foods organized a Kids Stewardship Day on the Trail [with free apples before and healthy make-your-own lunches after!]. From the store, we led nine hard little workers and their parents under the Hydraulic Road underpass to overgrown trail where they clipped and tossed and totally cleared thick vegetation all the way to the 250 Bypass. Thank you, Whole Foods for being a great trail neighbor and supporter! Whole Foods is sponsoring a special kid-friendly stewardship event for kids and their families. The RTF will lead a kid-friendly trail clearing activity, and Whole Foods is providing a healthy free lunch! Kids and families must RSVP for this event here. In 1998 UVA granted the RTF permission to build trails through the lovely riparian forest behind the JAG, Law, and Darden Business Schools. In 1999 more than 100 volunteers helped the RTF build trail and three "organic"-style bridges here on National Trails Day. 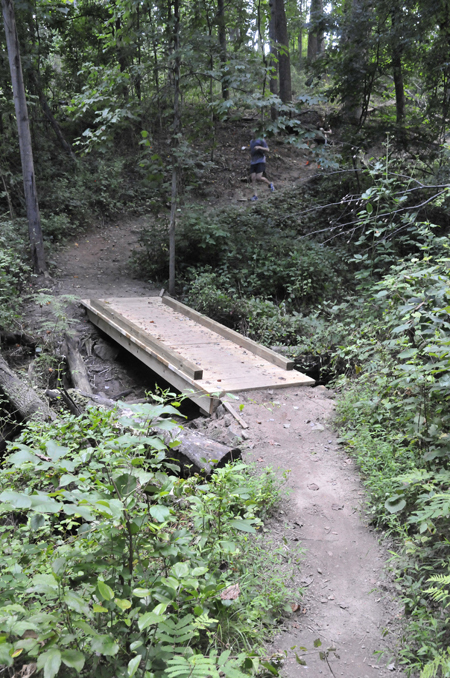 Now this section of trail is heavily used by members of the entire Charlottesville-Albemarle community, and numerous volunteers have continued to donate their time keeping it open and accessible, including most recently Eagle Scout Ben Beiter. A big thank you to UVA and to all volunteers! July’s Second Saturday work party volunteers established the beginnings of a new trail in the linear park that is currently being redeveloped by the City’s Parks & Rec. Dept. after several years of sewer interceptor replacement work by RWSA and stream restoration by TNC. The new trail is located downstream of the Jamestown Court footbridge. Please obey "private property" and "stay on trail" signs. We invite you to enjoy photos, explore, lobby for new bridges and passage through the railroad embankment, and take care of the trails you love by clipping on your walks or joining us at a future work party.